Welcome to the 2018-2019 school year at Crestmont Elementary! I hope you have enjoyed your summer vacation and are looking forward to the new school year. I am excited to be working with the families and staff to continue building a strong academic program at Crestmont. We continue to be designated a MASTER School, which means we will be focusing on Mathematics, Art, Science, Technology, Enrichment and Reading. I will share more information with you soon. Our faculty and staff are excited about the future of Crestmont. I am honored to be a part of such an amazing school community. Please make certain that your child is at school on-time and stays the entire day. Attendance and direct instruction is vitally important to student learning. Also, we are focused on helping children develop a passion for reading. To do this, we are encouraging families to read together each night. Everyone here at Crestmont has been busy preparing for the new school year, and they are rested and ready to begin. The custodians and district personnel worked over the summer to make sure our campus was ready for the first day. The first day of school is an exciting day for everyone, and with the first day comes a lot of information and paperwork. 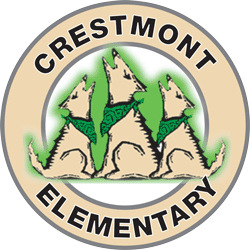 The Crestmont School Parent Handbook is posted on our website. The handbook is there to answer any possible questions you may have. If you do not have access to the Internet and need a hard copy, please stop by the office and we will be happy to provide one to you. Safety is very important to all of us. This year our campus will be even more safe in the minutes before school. You are welcome to walk your child to school. There will be two gathering spots this year at 8:15. The front of the school will be supervised and students will line up by Room 19 with a teacher. Promptly at 8:25 the students will walk to their designated meeting spot and be greeted shortly by their classroom teacher. Summerhill Dr. will be another gathering area for students, and they will be supervised there by a teacher. The students will remain with a supervising teacher until 8:25 when they will walk to their designated location to be greeted shortly by their classroom teacher. The staff at Crestmont felt that safety is very important and we discussed this change at great length. We feel that this change will provide a more safe campus. If you plan to drop off your student in the front of the school please do so with great care. Please do not use your cell phone while in the parking lot. If your child is having breakfast they will remain in the Multi-Purpose Room until 8:25 with the supervising teacher. This will begin on Monday, August 13, 2018. Many of you are involved in the school, and I cannot thank you enough for your time and dedication to Crestmont. Without you, many of the things at Crestmont would not be possible. If you would like to be more involved, I encourage you to become a volunteer in the classroom and/or join our Parent Teacher Club (PTC). Our PTC does an amazing job organizing events and they could use your help. I would like to have parent volunteer each day in the copy room to support our teachers, so that they can focus on curriculum and instruction. If you have a conference with your child’s teacher please check in with the office, obtain a Visitor’s Badge and proceed to the classroom. For the families returning to Crestmont, thank you for your continued support of the school and community. To our new families joining us this year, I would like to welcome you to Crestmont. If you ever have questions or concerns during the school year, please contact the staff at any time. We look forward to an amazing 2018-2019 school year.